This Oregon real estate training course package includes online Exam Prep & FREE printed National Exam Prep textbook. 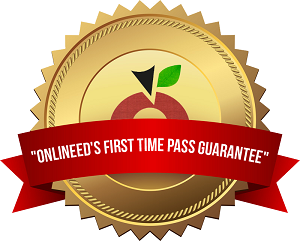 With OnlineEd's Exam Prep Bundle you'll receive over $500 in products not offered by our competitors. More than $500 in extra value! Our Exam Prep Bundle includes everything you need to complete your education and pass your real estate licensing exam. Price Match or It's Free! OnlineEd will match any competitor's verifiable, posted price for equivalant course packages marked with our Price Match icon. If you find an equivalant package cheaper through a competitor, but would still like our superior quality and delivery method, just give us a call at (503) 670-9278 when you are ready to enroll and we will match their price!